The Ideapad 110 has a number of features to maximize your productivity and comfort. The improved hinge design is more robust and allows for smooth 180-degree action to a flat position. The frameless keyboard allows your fingers to move freely without bumping, and the textured palm rest resists fingerprints and helps keep your hands in place without slipping – perfect for speedy touch-typing. There’s no need to purchase an external optical drive with the Ideapad 110. It comes standard with an integrated DVD/CD-RW drive so you can load programs, listen to CDs, or watch movies offline. The Lenovo Ideapad 110-141SK is powered by a duo-core Intel Core i5-6200U processor clocked at 2.3GHz. Sporting on-board Intel HD graphics and a dedicated AMD Graphics, the notebook PC comes with 4GB of RAM and 1TB(1000GB) of HDD-based storage. The Ideapad 110 is powered by a 6th Generation Intel processor with integrated graphics, giving you plenty of processing power for casual surfing, streaming, and playing. Lightning-Fast Web Browsing is enabled by 802.11 a/c WiFi connectivity comes standard on the Ideapad 110, making it perfect for blazing-fast browsing, streaming, and downloading. 802.11 a/c WiFi delivers up to 3 times the connection speeds of 802.11 b/g/n. A horizontal speaker grille sits above the keyboard, whereas the trackpad (along with left and right click buttons) is below it. Coming to the sides of the Ideapad 110, the left has the power jack, Ethernet port, USB 2.0 (1), USB 3.0 (1) and 3.5mm audio jack (1). On the right, there's nothing other than a tray-loading optical disc drive and a Kensington lock. There's also a card reader slot placed at the front edge of the bottom port. 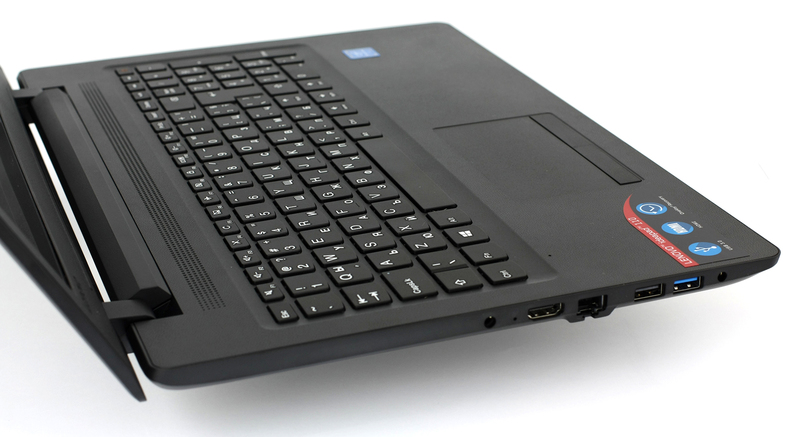 Overall, the design and build quality of the Lenovo Ideapad 110 to be appreciably good. The AMD Radeon R2 is an integrated DirectX 12 graphics card found in this Lenovo's AMD APUs E 1. It offers 128 shader cores across two Computer Units and is based on the GCN architecture. Clock speeds can be up to 500 MHz on this Zacate APU. The GPU does not have dedicated VRAM and will access main system memory on the APU: single-channel DDR3L-1066/1333/1600. Using its UVD (Unified Video Decoder), the GPU can support the CPU when decoding videos up to 4K. In addition, the chip integrates a specialized video encoder called VCE. Video streams can output via VGA, DVI, HDMI 1.4a and DisplayPort 1.2 to up to two external monitors. The chiclet keyboard does a good job. The solid base prevents the keyboard from denting. The pressure point is clearly defined and the key drop is very pleasant. Energetic typing should not cause problems. The keys that are lightly curved in the lower part also have a comfortable size. The touchpad supports multitouch and allows accurate inputting up into the lateral areas. For example, zooming pictures functions just as impeccably as moving files or folders. Both keys incorporated in the lower area have a firm, clearly defined pressure point. It is not too spongy, which prevents unintentional clicks. Order the Lenovo Ideapad 110 laptop and have it delivered to your doorstep within 1-3 working days or same-day delivery within Nairobi. Pay on delivery.